We love cookies! So when we made these yummy treats as a get-well gift for a close family friend, we made sure to make a double batch. We knew our fingers would be in that cookie jar before we could get the care package out the door. *Warning – These treats are sinful, proceed with caution! Using a stand mixer, beat butter and sugar together until smooth on medium speed. Beat in vanilla and espresso, then reduce mixer speed to low and add flour, adding small amounts at a time. Try not to work the dough too much once the flour is incorporated. 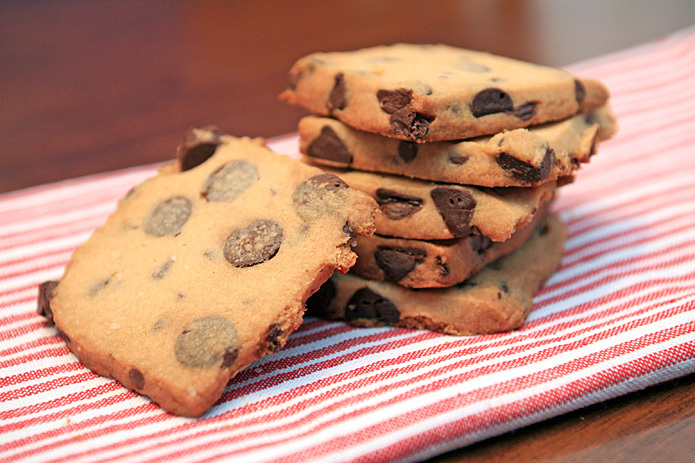 Fold in the chopped chocolate chips. Transfer the dough to a clean, floured surface. Roll the dough into a 10 x 10 rectangle that’s about 1/4 inches thick. Refrigerate the dough for at least 2 hours. Preheat the oven to 325. Using a sharp knife, cut the dough into squares. Transfer the squares to the baking sheets and bake for 18 to 20 minutes. Transfer the shortbread cookies to a rack and allow to cool. These are wonderful! I will be using this recipe as my base for any other shortbread cookies I make.